Home » News » Over The Edge » Ah, Maha! The annual music festival continues to grow. That’s my “slogan suggestion” for the 8th annual Maha Music Festival, being held at Aksarben Village Aug. 20, which features headliner Passion Pit, along with electronic popster Grimes, hip-hop phenom Vince Staples, returning Nebraskan Matthew Sweet and my favorite act of the line-up, Car Seat Headrest, a band that’s about to explode beyond the tiny, crippled indie music world (You heard it first hear on KTIM). Plus seven more star-studded acts and an entire park filled with fun, family-friendly festival mayhem. 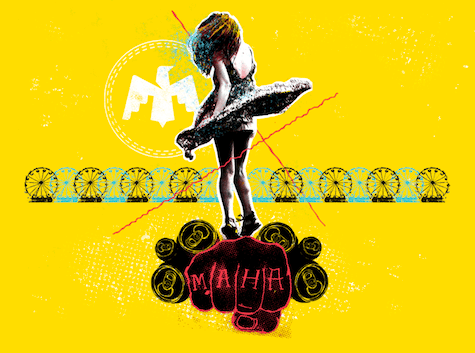 But instead of that genius catch-phrase, the Maha braintrust went with “Maha Moves” as this year’s marketing tag line. That’s not bad, either. In fact, the festival’s entire marketing platform was based around the idea that this year’s line-up is guaranteed to get your booty shaking — a very rare thing for Omaha indie music fans. In the end it didn’t matter since they couldn’t land Ryan Adams, anyway. Instead, they landed Passion Pit, whose music is structurally designed to make your body move, or at least wag your head to their hypnotic beat. Over coffee on the patio outside of Aroma’s in downtown Omaha during last month’s scorching heat wave, Schomburg explained the challenges involved in booking this year’s Maha Festival. To understand the challenges, you have to understand all the barriers and how the whole thing falls into place. Although everyone on the 10-member Maha Music Festival Board of Directors has input on the line-up, Schomburg said this year’s primary deciders were board members Aaron Shaddy and Bill Sweet, who worked hand-in-hand with Omaha super-promoter One Percent Productions (specifically, One Percent’s Marc Leibowitz). Many offers were sent out, and many were rejected for a myriad of reasons. In the end, the mirrors aligned for Passion Pit, a so-called “indietronica” act from Cambridge, Massachusetts, led by singer/songwriter Michael Angelakos, whose debut LP, Manners, was a hit for Frenchkiss and Columbia Records back in 2009. It was followed by Gossamer in 2012 with the hit “Take a Walk,” which expanded their fan base when the song was used by Taco Bell to introduce the Doritos Locos taco. Their last album, Kindred, was released by Columbia in 2015. Some have wondered why Grimes, a red-hot Canadian synthpop project led by Claire Elise Boucher, wasn’t named as headliner since their 2015 album, Art Angels (4AD Records), was on just about every music publication’s year-end “best of” list. Composed of a variety of area nonprofits, Maha’s Community Village provides alternative entertainment and hands-on activities from other area non-profits. It’s a real mish-mash of fun stuff, kind of like a science fair for local outreach organizations. Schomburg said the Community Village adopted a “platform” this year centered around mental health. “We’re partnering with Nebraska Medicine, the Kim Foundation, Community Alliance and other mental health organizations to raise awareness about mental health issues,” she said. “Suicide is the No. 2 cause of death among 18 to 34 year olds” — an age demographic at the core of Maha’s audience. The Maha Music Festival is Saturday, Aug. 20, at Aksarben Village. The Lineup: Passion Pit, Grimes, Vince Staples, The Joy Formidable, Matthew Sweet, Jay Farrar Trio, Diarrhea Planet, Car Seat Headrest, Diet Cig, See Through Dresses, Josh Hoyer & Soul Colossal and CJ Mills. Tickets are $55. The festival runs from noon to midnight. For more information, go to mahamusicfestival.com.